The front yard is the first thing people see when they look at your house. At least I know that's what people enjoy looking at with our new home. Why do you think curb appeal is such a big deal? Sometimes the best money you can invest in your home is to make the outside look beautiful. So whether you are looking to sell your home or just improve the way it looks on the outside, here are 5 ways to make it look more welcoming. I can't stand the look of mulch and maybe it's just me but I think stones make everything look cleaner and there is much less maintenance. I spent a couple hundred bucks putting stone down in our front yard and it looks beautiful! So clean and simple! It's so much easier to maintain because weeds aren't growing in! These Modern Tier Solar Lights are from Outdoor Solar Store and I couldn't be more pleased with the way they light up the front walk. You could also look for Solar Patio Lights. These are so beautiful! Not only do these help people see at night when they come up to the door or are leaving a get together but they also help me feel more secure because who would want to break into a house if it's all lit up so everyone can see? Look for pretty flower pots on sale and you will be amazed how much they improve the welcoming look of your home! We got rid of so many shrubs and the ones we do have we keep up with by trimming and pruning them on a weekly basis. Minimizing clutter for a cleaner look can be as simple as getting rid of a hose on the ground by getting a hose box. Get rid of any little embellishments that you don't use as well. Although it is a big investment, SHS Roofing professionals believe the best way to upgrade your home's curb appeal is a long-term investment like replacing the roof of your home. Not only will a repaired or replaced roof make your home more attractive, but it will also be an attractive selling point if you choose to put your home on the market in the future. 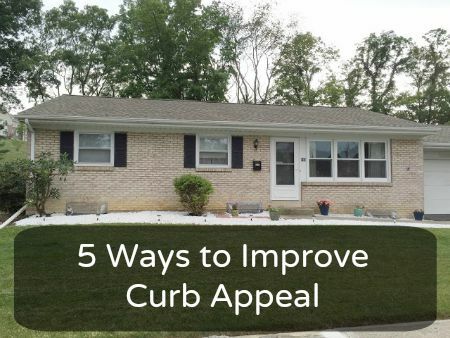 How have you updated your home's curb appeal? this makes me want to get a house! looks beautiful! When I brought my house. I redid the whole landscape of it.